The 200th anniversary of the birth of anti-slavery campaigner Frederick Douglass is to be celebrated at the National Library of Scotland from Thursday, 4 October. In a world-first, items from the Frederick Douglass family collection will be on public display. The letters, speeches and photographs from the Walter O. and Linda Evans Collection, which until now have never been seen by the public, are on loan to the National Library for a display to mark the occasion. Walter O. Evans is a collector and conservator of African American art, history and culture. He personally delivered the material to the Library in August, and returns to Edinburgh later this week for the launch of Strike for Freedom: Slavery, Civil War and the Frederick Douglass Family. The University of Edinburgh’s Professor of Black Studies and Personal Chair in English Literature, Celeste-Marie Bernier, is guest curator. She said: ‘For the first time, Strike for Freedom tells the story of the revolutionary activism not only of Frederick Douglass – world-famous freedom-fighter, liberator and human rights campaigner – but of his family members. Frederick Douglass started life as Frederick Augustus Washington Bailey when he was born into chattel slavery in Maryland in 1818. In freedom, his new surname was inspired by Sir James Douglas from Sir Walter Scott’s The Lady of the Lake. While the many public lives of Frederick Douglass as the representative ‘fugitive slave’, author, orator, philosopher, abolitionist and reformer continue to be told worldwide, this display tells the story of Douglass as a private individual and family man. It features manuscripts, letters, speeches and photographs of Frederick Douglass and his sons, Lewis Henry, Frederick Jr, and Charles Remond. The display also shows that Frederick Douglass was not alone in his journey to Scotland, and his work with Scottish antislavery societies. He was joined by a number of African American freedom-fighters who travelled to Scotland in their campaigns to abolish slavery, segregation, and lynchlaw, including Ida B. Wells-Barnett, Amanda Smith, Josiah Henson, Moses Roper, and Ellen and William Craft. Strike for Freedom: Slavery, Civil War and the Frederick Douglass Family runs from Thursday 4 October until Saturday 16 February 2019 at the National Library of Scotland, George IV Bridge, Edinburgh. Entry is free. Slavery, like all other great systems of wrong, founded in the depths of human selfishness, and existing for ages, has not neglected its own conservation. Custom, manners, morals, religion, are all on its side everywhere in the South; and WHEN YOU ADD THE IGNORANCE AND SEVILITY OF THE EX-SLAVE TO THE INTELLIGENCE AND ACCUSTOMED AUTHORITY OF THE MASTER, YOU HAVE THE CONDITIONS, NOT out of which slavery will again grow, but under which it is impossible for the Federal government to wholly destroy it, unless the Federal government be armed with despotic power, to blot out State authority, and to station a Federal officer at every cross-road. This, of course, cannot be done, and ought not – even if it could. The true way and the easiest way is to make our government entirely consistent with itself, and give to every loyal citizen the elective franchise — a right and power which will be ever present, and will form a wall of fire for his protection. HE was one of the most important social reformers in the history of the USA and now users of the National Library of Scotland [NLS] are to be given a unique chance to learn about Frederick Douglass. For yesterday the Library [NLS] was presented with a significant loan of material about Douglass, an author, abolitionist and philosopher who was born a slave in Maryland in 1820 and lived to be one of the most famous black men in America, dying in 1895. He visited Scotland in 1843 and his speeches converted many to the cause of the abolition of slavery in the USA. 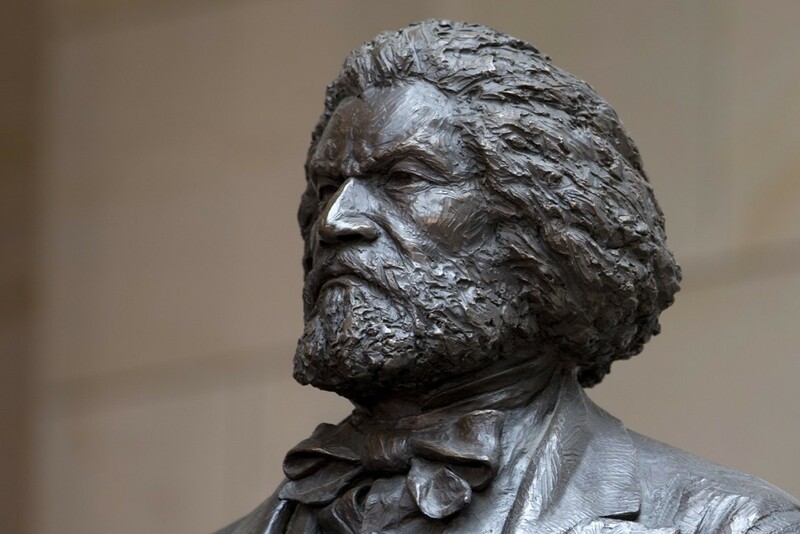 Now in a world-first, the Frederick Douglass Family Collection, held in the Walter O and Linda Evans Collection, will be on public display for the first time outside the US at the National Library later this year. The display will exhibit manuscripts, letters, speeches and photographs of Frederick Douglass and his sons, Lewis Henry, Frederick Jr and Charles Redmond. The loan was made possible by the generosity of Linda and Walter O Evans, a world-renowned collector, curator and conservator of African-American history, culture and memory. Walter O Evans flew into Edinburgh to personally hand-deliver items from his Frederick Douglass collection to Dr John Scally, National Librarian. NLS stated: “While the many public lives of Frederick Douglass as the representative “fugitive slave”, autobiographer, orator, philosopher, abolitionist and reformer continue to be told worldwide, this display will tell the story of Douglass as a private individual and family man.